Work when you’re most productive with 24/7 facility access. Membership doesn’t have to lock you in either--join with day passes, month-to-month, or custom time commitments and still get the most affordable pricing in town. The local and regional transportation services are also excellent and make the center easily accessible for both occupying tenants and commuting visitors to the site across numerous road and rail networks. Conveniently located close to the downtown area, a free shuttle provides easy transport facilities and Six street clubs and other leisure activities are conveniently located moments away. This centre offers great designs and comes with tasteful and high quality furnishings throughout. This prime location in Austin will not disappoint. Enjoy the unique and modern appeal in the city if "weird". Austin has many fine shopping, dining and architectural viewings that call for the perfect mixture of work and play. don't let this center slip through the cracks before you check it out! Occupying the whole of the 4th floor of this exceptional class A building and with fabulous views over downtown Austin and the surrounding area, this exquisitely furnished business center location provides a wide range of flexible office space solution packages; as well as a contemporary premium business lounge, spacious corporate meeting rooms and an on-site fitness center and health club available for tenant use as standard. Situated only 30 minutes from Austin-Bergstrom International Airport and a number of other major transport hubs, this exquisitely furnished business center is easily accessible and provides both flexible office space as well as a contemporary and comfortable business lounge and breakout space area for casual meetings and a number of spacious and more private meeting rooms for more formal meetings and conferencing purposes. From ambitious and engaging start-ups to Fortune 500s and some of the most successful blue chip corporations around, this technologically powered and highly sophisticated co-working space is ideal for collaboration and is located among the historic and locally renowned oaks of central Austin, the site is situated conveniently just steps from I-35 and Highway 183 making it easily accessible from the main airport in just 20 minutes. This center is one of the finest in downtown Austin. It has a beautiful modern appeal and tons of amenities. It offers furnished offices, flexible terms and a kitchen on-site. You also have access to the copy and print facilities and postal and mail handling to help your business succeed. You can enjoy collaborating with the team in one of the conference or meeting rooms or buckle down for an important meeting or call. This center is located right on the Colorado River making for magnificent views. For any visitors or clients in town the Four Seasons Austin is just blocks away. Austin is known for its weird and unique attractions, so take advantage. Topped with a rooftop lounge area with beautiful skyline views this collaborative workspace provides fully furnished private office space and co-working areas in downtown Austin, minutes from the Texas State Capitol. One of the many highlights is a unique meditation room to help relax and recharge away from your work. The regional transport links are excellent, with a number of convenient and frequent services in regular operation. A premier Austin business centre that is very upscale in this nice location. The centre also offers easy travelling into the busy downtown district with great views on the high floors and benefit from an onsite fitness centre. Situated just off of North MoPac Expressway in a modern and shopping food district of northern Austin this creative and collaborative office space is made up of large common areas, shared workbenches, private offices and conference rooms. The regional transport links available throughout the area are excellent and fantastically convenient, with a wide range of frequent services in operation throughout the area. Office space not available next to the big names in Technology. This centre is close to the Austin major loops (1 and 360), includes a range of facilities including easy onsite parking, and well appointed interiors. This center is due to open soon and will provide fully furnished office suites from a mixed-use, 27-storey tower on the Drag in Austin, right next to the University of Texas campus. This technologically powered and highly innovative office space provider features a collaborative and highly flexible co-working area, ideal for team working and a fully equipped business lounge and contemporary breakout space close to the popular and vibrant downtown Austin area, which makes the business center easily accessible from the MOPAC Expressway and within close proximity to the Central Market. This high grade building has been recently refurbished and located off 7th and Lavaca Street. The suites are renovated to a high standard and include many onsite amenities and services. Easy freeway access and close to the ABI airport makes this an ideal location. Minutes from the regionally popular and idyllic Zilker Park, this light and airy professional office space building offers beautiful views and is just south of downtown Austin and the wide range of services and amenities it provides. Free and secure parking provision for your clients and guests is easily available on site and the business center itself is but a short drive from local shops and restaurants. Minutes from downtown (off of popular South First Street) this business center is ideally located to take advantage of some of Austin"s best restaurants, food trucks and cafes. Members have access to great amenities regardless of whether they take office spaces, dedicated desks or co-working memberships. Close to the beautiful hills of Hill Country and in Austin"s central business district, this innovative shared and private workspace has floor-to-ceiling windows that offer beautiful views. Stylishly furnished the center is alongside the University of Texas, ideal for attracting the local talent pool. Furthermore if you do bring your dog to the office with you then you can take advantage the nearby dog park. There is also an amazing selection of local bars and restaurants, all within walking distance of the building. Serviced space offered near Mopac Expressway and to Highway 183. Other transport links to the downtown district is also conveniently situated nearby. The office suites offer a range of facilities including and disability access, all in this spectacular backdrop. Multiple office suites to choose from, all brand new that include fully serviced conference rooms. Multitude of amenities allow this office to rise above its competition. This space can come fully furnished or unfurnished depending on your office needs. Located near many different restaurant options within three miles of the building. Building comes fully equipped with an on-site gym that includes showers. This high-quality business center enjoys a breathtaking location overlooking a lake, and offers excellent office space with stylish fittings and secure entry system. Conveniently close to local amenities and Austin-Bergstrom International Airport. 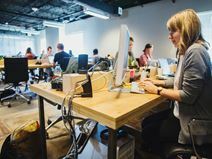 These bright, premium premises are located in Austin, Texas among a hub of thriving industry players and exciting new corporate start-ups. Austin is known for its low business costs and pool of educated talent. Situated in the heart of northwest Austin, this center is easy to access and is located in a parkland setting with lush views. This is an ultramodern building offering excellent office accommodation. This stunning center enjoys a Class A office park setting with lush views of the 48-acre campus and habitat preserve. This center offers prospective tenants with the ideal working environment for any type of workspace need. Opened in January 2016 this business center occupies the ground floor and 4th floor in the central business district adjacent to Lady Bird Lake. From the private offices you will have great views of downtown and access to an enterprise-class, Tier 1 IT infrastructure. 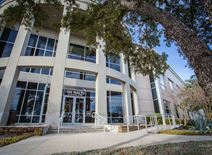 Located in the heart of central business district, this center occupies the ground floor and the entire 4th floor of the San Jacinto Center. The unique 28,000 square foot facility will feature 24 private office suites on the 4th floor totaling 250 workstations and a unique coworking and event space on the ground floor. Located in the heart Downtown Austin this business center is located in a brand new, world-class building with floor-to-ceiling windows and offers both collaborative and private office options. Just a stone"s throw from Capitol and Warehouse District. Off of popular South First Street in the heart of South Austin this center provides monthly networking events to enhance the sense of community and collaboration between the individuals and companies that use the private offices and co-working areas here. Overlooking the Wild Basin Reserve and with fantastic access to Loop 360 this beautiful, scenic location has a brand new fit-out and offers a prime location for an amazing price. Some suites have private balcony views of Downtown and the Greenbelt.